Bits and Pieces...: It's Friday! Happy Friday! Summer finally feels like it has arrived. Yay! I can't wait until school is out and we are finished with our crazy schedule. It won't be long now. I've still been busy doing lots of stuff I can't share yet. But, I do have a card I want to post. I just got my copy of Card Creations 8 and it's packed with amazing projects. I love how this one turned out. 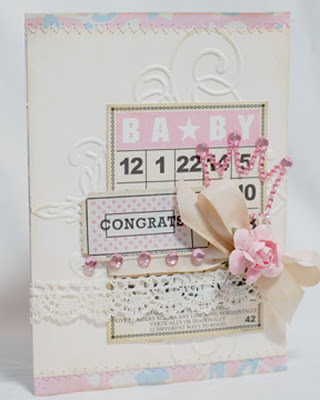 I used a Jenni Bowlin bingo card, lots of Zva bling and and a Cuttlebug embossing plate. I love the vintage feel the tea dyed twill and trim give it. oh that is just the prettiest card I've seen in a long time. It's beautiful!! Leslie and I just saw this yesterday at Michaels, we paged through and found your card. 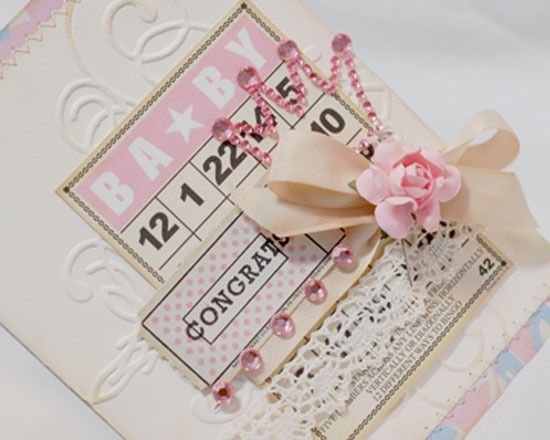 How sweet and beautiful this baby card is! I love the vintage look the card has too. And it's so soft and pretty. Just a stunning card Anabelle! So soft and sweet! Soooo pretty! Have enjoyed your blog! Pretty pretty pretty soft pink card, love it!